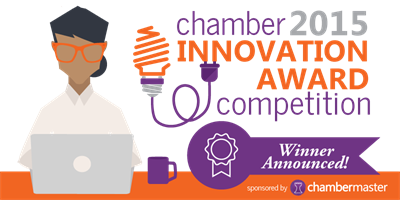 ChamberMaster recently announced the winners of its 2015 Chamber Innovation Award competition. In its second year, the competition showcases enterprising Chambers of Commerce from across North America. The competition recognizes innovative programs, events, and ideas that challenge the status quo. Entries were received from a wide array of organizations of all sizes and from across the U.S. and Canada. With a record number of entry submissions, the contest was extremely competitive. The winners were selected by a distinguished panel of industry experts, including Chamber Pro Frank Kenny and Cathi Hight of Hight Performance Group. Entries were judged on creativity, community impact, and value to the Chamber. The competition was powered by StartUpLocal.biz. The top 5 innovators will be featured in the 2015 Edition of Chambers of Inspiration. Scheduled for release this fall, the e-book will showcase the successes of inventive and forward-thinking organizations.